The aim of this study is to explore the outcome of Teucrium polium (TP) medicinal plant consumption on the early stage of fetal development. We used the chicken embryo at 3 days of incubation as a model to evaluate the effect of TP plant extract during embryogenesis. In addition, quantitative polymerase chain reaction (qPCR) was applied to explore the expression of six genes related to cell proliferation, apoptosis, sur­vival, angiogenesis, and migration. Our data revealed that TP exposure inhibits angiogenesis of the chicken embryo and its chorioallantoic membrane. In addition, we found that TP extract significantly harms the normal development of the embryos since around 95% of TP-exposed embryos died after 1–3 days of treatment. Macroscopic examination did not show any anomalies in these embryos. However, qPCR analysis of activation transcription factor-3, B-cell lymphoma-2, caspase 8, inhibin subunit beta A, vascular endothelial growth factor-C, and Cadherin-6 type-2 genes revealed that these genes are considerably deregulated in heart and brain tissues from TP-exposed embryos in comparison with their matched tissues from unexposed ones. 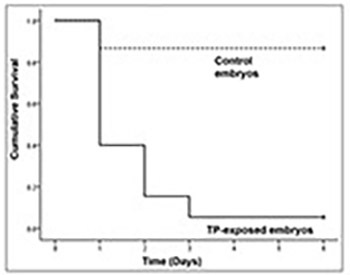 Our study implies that TP plant can have very toxic effects on the early stage of the embryo. Therefore, it is important to alert expectant women to avoid the use of this medicinal plant during pregnancy.